Set approximately 10 years after the events of the original BioShock, the halls of Rapture once again echo with sins of the past. Along the Atlantic coastline, a monster — somehow familiar, yet still quite different from anything ever seen — has been snatching little girls and bringing them back to the undersea city. It is a Big Sister, new denizens of Rapture who were once one of the forgotten little girls known as Little Sisters, known to inhabit the city's dank halls. No longer a pawn used to harvest ADAM, the dangerously powerful gene-altering lifeblood of Rapture, from the bodies of others and in turn run the risk of being harvested herself, the Big Sister is now the fastest and most powerful thing in Rapture. That said, the gameplay is more about luck than strategy. 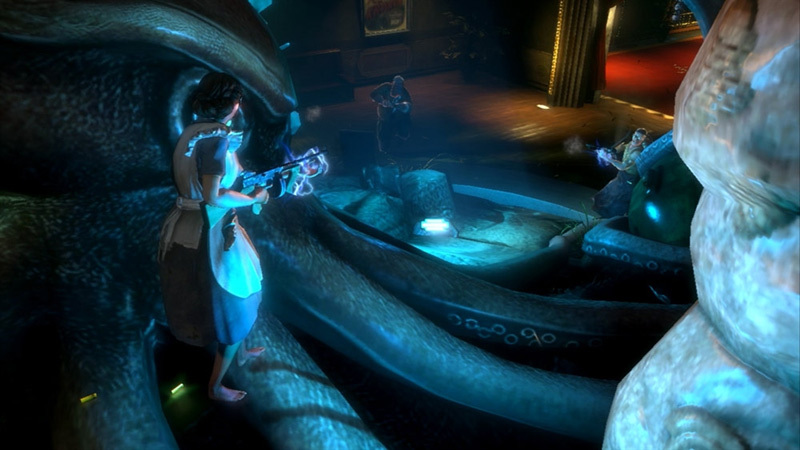 BioShock 2 plays more like early PS2 multiplayer titles such as TimeSplitters rather than technical, multi-faceted experiences like the Call of Duty games. There's a lot of visual noise: with a chaotic room of plasmids going off, the screen can get pretty crazy, and you might have to resorting to merely melee-ing anything that happens to stumble in front of you. 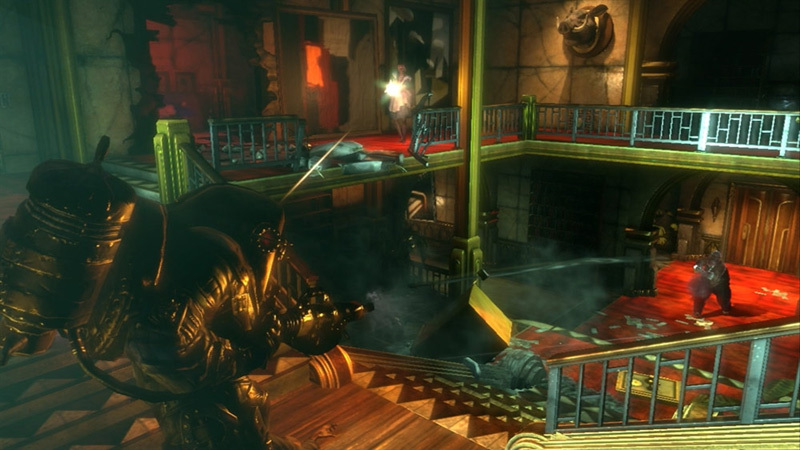 Every weapon in BioShock 2 is more impressive and more satisfying than its equivalent in BioShock 1. The shotgun is now a double-barreled shotgun. The basic pistol has been replaced by a lethal rivet gun that treats Splicer flesh as scrapyard metal. The machine gun has been upgraded to a turret-sized Gatling gun that couldn’t fit in human hands, let alone be carried by them. There's a certain straight-to-DVD feel with this sequel, which constantly evokes the original without ever eclipsing it. But perhaps it's callous to stack it up too harshly against its brilliant predecessor. BioShock 2 houses great combat, an entertaining multiplayer game, some truly standout set pieces, and a story you'll want to see through to the end. Yes, it's certainly overshadowed by the one that came before it, but it's worth experiencing on its own merits. Precisely what you choose to do when you are beholden only to yourself and your own moral constraints is the backbone of BioShock 2. Rapture may not be as mysterious and intriguing this second time around, but it is nonetheless host to a powerful and moving tale that allows you to better realize--or pervert--Ryan's principles at your own discretion. Regardless of whether or not this is a return visit to paradise lost, there is plenty to be found here to make it a worthwhile, meaningful, and compelling one. When this game recognizes its true potential, it shines. It’s just a shame that it wanders misguidedly for so long. The first 10 hours are not bad or forgettable, they just don’t branch out from the safe confines of the first BioShock. The controls are just as tight as they are in the first game, and the explosive plasmid play once again makes brutality against splicer nation an undeniable blast. It's hard to make too many direct comparisons to the first BioShock when talking about this sequel, because such a big part of the first game was seeing Rapture for the first time and experiencing a real sense of discovery as you went deeper and deeper into its fiction. Returning to Rapture--even a different part of the city--is naturally going to be less impressive. 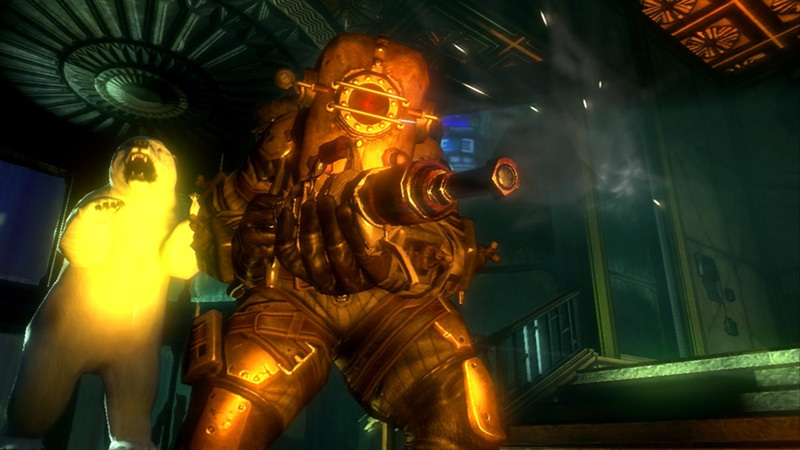 But the smart additions on the gameplay side make BioShock 2 rewarding in a different way, while those who want to know more about Andrew Ryan's underwater city will find just enough to make the return trip worthwhile. 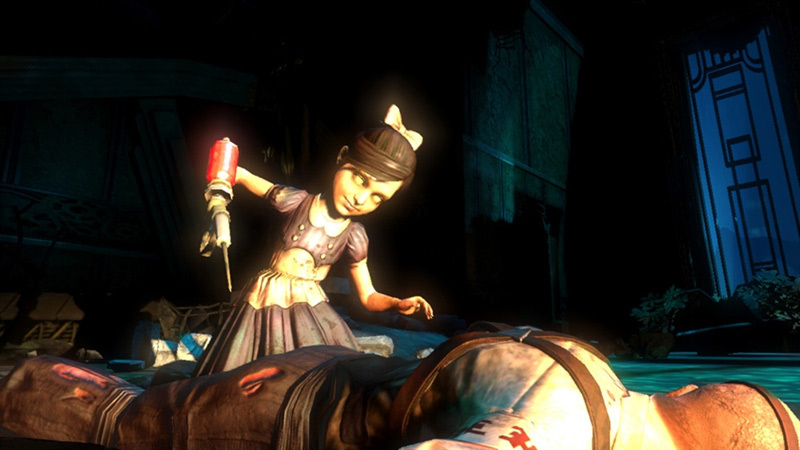 In many ways BioShock 2 is a game about refinements, rather than wholesale changes. 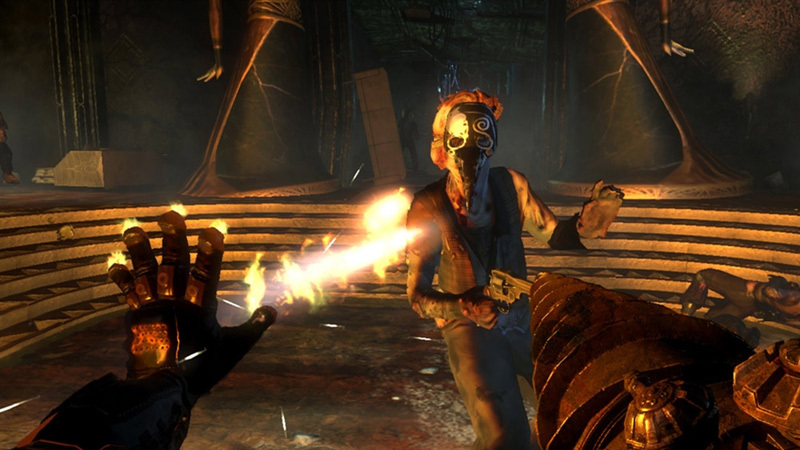 Combat is better, thanks to the dual wielding, better enemy variety and larger scale encounters; hacking has been simplified, now making use of a timing-based button pressing mechanic that fits far better than the tubes seen in the previous game; and replay value has been enhanced by the sheer number of ways you can customise your character through use of Adam and upgrade stations. 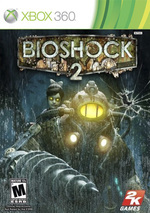 Anyone looking for a first-person shooter that offers more than flat, stereotypical characters and copy-and-paste supersoldier plots, one that attempts to establish a sense of right and wrong and loops you into the decision making process, and one that's set in one of the most vividly realized settings around should pick up BioShock 2. It's a game in which story, setting, and gameplay are expertly blended to create an experience that's as thought-provoking as it is entertaining. BioShock 2 argues even within the strictures of fate that mercy and compassion or bitterness and revenge ring loud enough to echo through the lives of those who follow. The result is a less openly provocative game than its predecessor, and one that will capture less attention, but while it may be damned for subtlety it is every bit as deceptive, and perhaps that's the greater of the series' illusions regardless of what else a BioShock sequel might have become. If it wasn't for that expanded, heightened, desperate combat, and how neatly that sidesteps into a surprisingly characterful multiplayer mode, this would be a lacklustre sequel. It's redeemed by the surfeit of combinations, upgrades and gene tonics which allow you to truly specialise, creating a psychedelic, explosive fighting style all of your own. If there's a third game (of course there bloody will be), it cannot be set in Rapture again. We've seen enough of it now. This second tour of duty with far superior toys is everything it needs to be, though. Pero seamos sinceros, un giro radical no sólo no era necesario sino que hubiese resultado contraproducente cuando se parte de una base tan sólida. Los pequeños ajustes jugables hacen de Bioshock 2 una experiencia más llevadera, y la historia (que puede gustar más o menos que la del primer juego, pero es igualmente sobresaliente) sigue fluyendo con una soltura narrativa de la cual muy pocos juegos hacen gala. Es más de lo mismo, sí… pero eso es justo lo que queríamos todos los que ansiábamos regresar a Rapture. Bioshock 2 supone el regreso de Rapture y su Gran Cadena, y con ésta una nueva inmersión en las profundas aguas que envuelven a Rapture, y por ende, también en lo más oscuro del ser humano. Algo falta del espíritu único del original, aunque para ser honestos aquello era poco menos que irrepetible, pero eso no debe ser óbice para considerar a este videojuego un sobresaliente manifiesto del estado de madurez que el First Person Shooter ha alcanzado en esta generación. BioShock 2 es un gran juego, pero que vive a la sombra de su predecesor. Estamos ante una aventura intensa, con una fuerte carga argumental, una gran puesta en escena, un acabado técnico de gran calidad, y con un multijugador solvente; posiblemente, uno de los mejores juegos de este 2010, que consigue estar a la altura de las expectativas generadas a su alrededor. Pero le cuesta salir de un cierto encasillamiento provocado por la gran revolución que supuso la entrega original, que le impuso una jugabilidad con la que no se atrevieron a innovar demasiado, limitándose a ofrecernos un nuevo punto de vista dentro de la misma ambientación. Se avete amato BioShock per la sua componente avventurosa e per la splendida atmosfera, quindi, troverete BioShock 2 meno geniale e sconvolgente, ma dall'altra parte non potrete che apprezzare gli intelligenti ritocchi fatti al sistema di gioco. Gli scontri sono ora più vari e fluidi, e spingono a sperimentare tutti i poteri molto più di quanto non accadesse in passato. Als je de sfeer in het eerste deel al fantastisch vond, kun je je absoluut vinden in BioShock 2. De sfeer van een gevallen Utopia straalt namelijk van je scherm af en is overal in terug te zien. Ook leer je nu weer meer over de achtergrond van Rapture, en daarnaast geven de nieuwe wapens en krachten je nog wat meer mogelijkheden om het spel op verschillende manieren te spelen. Helaas kent de game wel een minpunt, want echte vernieuwing is er niet te vinden. En helt unik spelvärld, fylld med så mycket hemskheter att man inte annat än kan älska den. Rapture förfaller sakteliga där nere på havets botten, men inuti pågår sällsamma maktkamper om de återstående ruinerna. Jag är glad att återigen ha fått äventyra under ytan och även om det inte riktigt lever upp till originalet är Bioshock 2 ändå en värdig uppföljare till ett av 2007 års allra bästa spel.